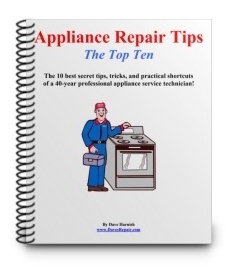 Appliance Repair Help - From a 40-Year Pro Technician! Have you been told that it's not practical to repair major appliances any more - they should just be replaced? And I'm here to help! I get a real kick out of sharing the trade secrets and insider tricks I've learned over the years - with YOU, the 'handy' homeowner! You just won't find the practical, hands-on information on this site anywhere else! It's NOT the usual "is it plugged in?" or "is there power to the outlet?" kind of useless "troubleshooting" material that we used to call common sense! I published the DRSNews, a monthly email newsletter sharing what I've learned, for over a decade, but since I'm trying to "semi-retire" (sort of) have decided to discontinue writing it. But you'll find newsletter back issues and appliance repair tips and articles here on the site, so feel free to dive in, no email signup required! I'll Post YOUR testimonial - with a Live Link back to your website! Feel free to browse around the site, and be sure to bookmark it. It's simple and a bit, well, dated, I know, but I've been concentrating on making this information available rather than just pretty. I'll regularly be adding more resources for you, including more Vintage Parts, helpful DIY Articles, more Vintage Manuals, and other useful information. Thanks for stopping by! May God richly bless you and yours!